Boomtrain is an award-winning and result-orientated marketing tool that makes use of an efficient artificial intelligence engine to analyze web content in detail to provide a full picture of user behavior from websites, emails, mobile apps and other customer touch points, and help you derive actionable insights. Once all useful information is on the table, companies are able to improve and personalize customer experiences in whatever channel, and to do so in a quick and cost-efficient manner. The numerous integrations offered by the system ensure that you will be able to migrate data with minimal effort, and eliminate the need to use additional marketing tools and business systems. This marketing automation solution helps companies implement effective strategies by delivering individually relevant messages via any channel, at any scale, and in real time. Boomtrain helps businesses smartly market their services and products to their target audience with cross-channel marketing automation, customer and profile tracking, and marketing template customization. This results in more personalized user experiences, allowing you to elicit desired behavior and take desired actions. Together with the standard marketing automation packages, the company offers quote based enterprise pricing for large companies in need of complex marketing data analyses. Once implemented, Boomtrain easily becomes a one-stop-shop for managing web content. Boomtrain is the ‘thinker’ every company needs to send relevant notifications to its customers, as the app leverages machine learning, and generates more clicks using predictive algorithms, and transforms effective communication into the company’s main source of engagement and profit. As such, the system doesn’t only deliver notifications to its customers, but also all relevant emails, and individual messages. According to developers, the product’s personalization strategy was developed with the advice of interface experts from Amazon and Netflix. Another distinctive advantage of Boomtrain compared to similar marketing systems is flexibility – the system is web-based and suitable for every device, serves almost any geography in the world, and can meet the needs of mostly large enterprises which is why it naturally responds to the needs of smaller and midmarket users. What is particularly impressive, though, is how the system cuts operational costs, and that’s not only due to its impeccable functionality – the reason why most users choose Boomtrain is because the product is cloud-hosted, and eliminates all need for complex maintenance and updates to be completed by the user. Boomtrain is not all about function, as one of its most distinctive advantages is how it looks. As you will read later on, machine learning is leveraged to eliminate all complexity related to customer experience design, meaning that a variety of semantic analyses, collaborative filtering, and viral response predictions were made in order to asses people’s reactions to the product, and to make onboarding as smooth as possible. The best part is that the experience and the interactions are consistent and seamless in every channel, regardless of whether you’ve chosen to communicate with your customers via email, mobile, or web apps. Users of iOS devices shouldn’t be concerned either, as the system is fully optimized for their devices. 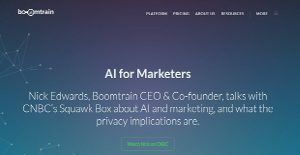 Before anything else, Boomtrain helps companies create and deliver personalized 1:1 customer experience with its powerful marketing engine and the artificial intelligence at its core. Inspired by the most successful thinkers in the user interface industry (Amazon and Netflix designers), this machine was developed to help businesses gather valuable insights about their users, and provide predictive recommendations so that they can deliver relevant experiences for every website through personalized emails, notifications and across your mobile communications. The ultimate target is to tailor communications to valuable engagement portals and profit-generation tools, in particular for lager companies and enterprises which don’t have enough time to dedicate to every customer. At the end of the day, Boomtrain is one of the rare programs that make use of what the company already has, instead of requiring it to adopt expensive practices for making use of its web content. Boomtrain has one of the most robust and powerful API engines which integrates with the best marketing automation and email marketing systems in the industry. The list of premade connections is long, and delivering notifications, and individually relevant emails and messages is made easy and quick. Once data starts flowing seamlessly from one product to the other, consolidation and duplicate work will be minimized, and that’s one more way for this product to increase your engagement and ROI rates. Some of the integrations include: WordPress, LiveInternet, Oracle, Magento, Mailjet, Whatcounts, Litmus, Slack, Segment, Hubspot, and many more. If you’re looking for that one specific functionality that must be noted, take a look at multichannel messaging. Once you’ve started using Boomtrain, you’ve given your team access to diverse marketing automation possibilities (web, mobile, and email) as well as the chance to profit from literally every channel of communication. The inbuilt functionality allows you to communicate with your customers via email, push notifications, SMS, messenger, lightbox, and in-app alerts to engage them on the channels that works best. The presence of an internal corporate communication network ensures everyone in the team will stay on the same page, and follow a common workflow. With Boomtrain, making sense of all the data and information from customer touch points becomes simple thanks to its analytics features. Boomtrain’s AI engine builds complex user graphs and semantic topic models to unearth latent needs and discover hidden relationships between users and content/products. It also allows you to accelerate your marketing efforts via best practices, guided implementation and consulting services to maximize ROI. The system’s custom marketing accelerator program covers every stage of the customer lifecycle. From acquisition to onboarding to abandon shopping carts, you can quickly implement a broad array of marketing usage cases. Enterprise-grade functionality is usually associated with significant investments, which is why you should never settle for less than impeccable technical assistance. Boomtrain is certainly one of the systems that can be praise for high quality customer support, as its experienced team can be contacted via phone, email, and offers on site live support. To make matters even better, the product’s so-called Boomtrain University offers a variety of advanced training materials users should consider in order to make the most of this powerful marketing system. What Problems Will Boomtrain Solve? A 24-hour news organization focusing on local news with a website that receives close to 1.6M views. Its an online portal where a users look to for news on politics, sport, faith, culture and more. The team at this organization was initially sending the same content to all of their 100K subscribers in a daily newsletter. The team wanted a more efficient, personal way to send the daily newsletter and to include recommended content in it. The newsletter along with their social efforts were driving close to 1.6M views to their website. After switching to Boomtrain, the 100K+ subscribers now each receive personalized newsletters based on their prior engagement levels and interests. Since each enterprise has unique business needs, it is prudent for them to refrain from searching for a one-size-fits-all faultless software application. Needless to say, it would be pointless to try to find such a system even among widely used software solutions. The smart thing to do would be to list the various essential factors that require consideration such as key features, budget, skill levels of employees, company size etc. Then, you should do your groundwork thoroughly. Read some Boomtrain reviews and investigate each of the other solutions in your shortlist in detail. Such exhaustive homework can make certain you reject ill-fitting systems and zero in on the solution that provides all the elements you need for business success. How Much Does Boomtrain Cost? We realize that when you make a decision to buy Marketing Automation Software it’s important not only to see how experts evaluate it in their reviews, but also to find out if the real people and companies that buy it are actually satisfied with the product. That’s why we’ve created our behavior-based Customer Satisfaction Algorithm™ that gathers customer reviews, comments and Boomtrain reviews across a wide range of social media sites. The data is then presented in an easy to digest form showing how many people had positive and negative experience with Boomtrain. With that information at hand you should be equipped to make an informed buying decision that you won’t regret. What are Boomtrain pricing details? What integrations are available for Boomtrain? Pros: It has proven to be more reliable that what were previously using. Boomtrain has been able to provide better insights for our audience plus fresh data to go with it. This has led to the expansion of content as we are able to capture even the behavioral data of our audience online. The aim is to achieve a better and reliable expansion planning for our team working closely with the customer team. With this kind of expansion we are able to make customers and audiences understand the content clearly and thus meet our objectives in full. Cons: There is not much to say negative about the product. Despite it being at the top of similar tools in the market, its reporting and dashboard features still need improving. This is not necessary a big problem as they are making progress in trying to upgrade these functionalities to better serve the user. With such efforts, you can expect the reporting and dashboard to be top notch with future upgrades of the product. Pros: We managed to implement Boomtrain within two different publishing properties. We quickly find out that the solution is better than the previous one.With this software we can build expansive content and behavioral data by gathering new data and audience insights. Its customer team is extremely powerful and they work along with us so we can use the product to its fullest. Cons: The product itself is great, but they still work on the dashboard and the reporting features. We managed to implement Boomtrain within two different publishing properties. We quickly find out that the solution is better than the previous one.